Dual Lane Slip N slide, water slide Jump City’s Double Lane Water Slip n Slide! Inflatable Water Slide when kids want to enjoy a classic! 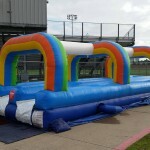 Jump City’s Double Lane slip n slide has 2 full lanes adding a competitive component to this water slide rental. The second or dual lane on this slip n slide also allows for double the throughput at events, or birthday party rentals for children of all ages. The line for this refreshing party water slide rentals will move very fast. Everyone will have MANY turns sliding down this slip N slide. Boys or Girls will enjoy this water slides bright non gender specific colors and graphics. This is not the slip N slide from our childhood, this waterslide is comfortable, refreshing and fun for teenagers, 6 year olds, and any healthy individual under 235 pounds. that running and launching onto the ride is safe per there physical condition. Jump City has always served a major portion of DFW (our delivery area) we have now purchased our second warehouse in the Garland area, so we may expand our delivery area to include : Dallas more parts of it is a big City, Garland, Plano, Richardson, Allen, Dallas, Rockwall, Rowlett, Murphy, Sachse, Sunnyvale area Choose Inflatable Themed Bounces, Classic Castles, Slides, Climb and Slide Combos, and Jump, Climb and Slide Inflatable Combos for your party! Click on any photo for more information.